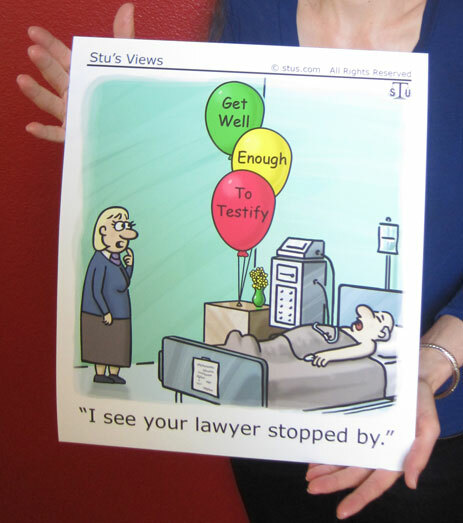 Any of our cartoons can be purchased as a print. Email inquires to stu@stus.com or call 619-297-4001, 9-5 Pacific Time. Unsigned prints are $100. Prints signed by both Maddy and Stu, with or without a dedication, are $175. Shipping is free. Stu's Views frameable prints are produced by a high-end professional fine art reproduction company. We have selected an archival-quality fine art paper that is an acid-free, 100% cotton, single-sided coated paper showing a natural white finish with a slightly structured, soft-textured surface matte. The weight of the paper is 255 g/m². The print dimensions depend on which of our two standard sizes your selected cartoon comes in. The cartoons that are slightly taller than wide will be 12 inches wide x 14 inches tall, plus a 1/2 inch white border. The short cartoons will be12 inches wide x 8 inches tall, plus a 1/2 inch border. Prints are sent via First Class Mail in a flat envelope with cardboard support. We have never had a problem with the mails, so are happy to replace your print free of charge in the very unlikely event that it gets damaged during delivery.